Native to South Africa this dark blue form of Plumbago was first introduced to Australia 25 years ago and has established itself as a hardy garden favourite. Ideal for use as a hedge from 1 to 2 metres or as a stand alone plant. Flowers prolifically from October to May. Drought tolerant once established although weekly watering’s throughout summer will result in heavier flowering. 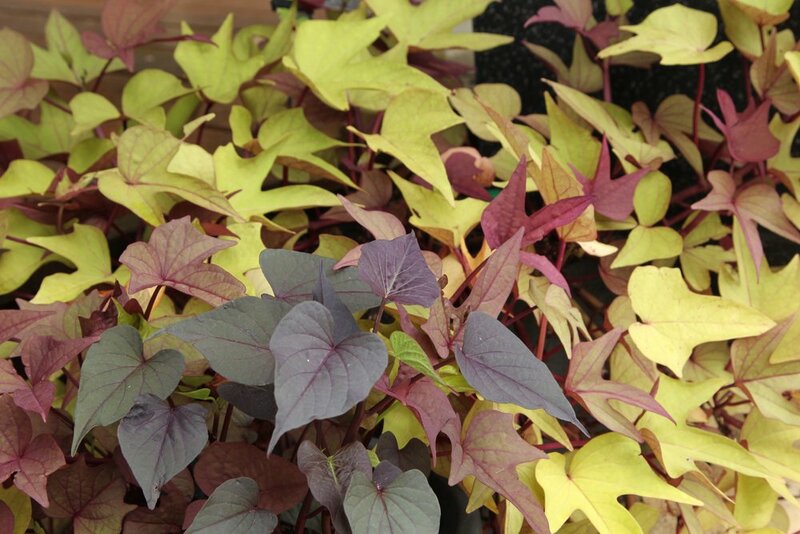 These hybrid plants were first introduced to Australia in the early 1990s and consist of colourful heart-shaped or maple shaped leaves in shades of chartreuse green, purple-pink and purple. They make a great ground cover or can be grown in a hanging basket. You can eat the young leave and young tubers but they aren’t as tasty as the edible variety. To propagate simply put a stem with a few leaves in a glass of water and they soon shoot roots. Plants do not like frost and in cooler areas they will die back in winter. Grow in full sun to part shade and provide ample water in summer.